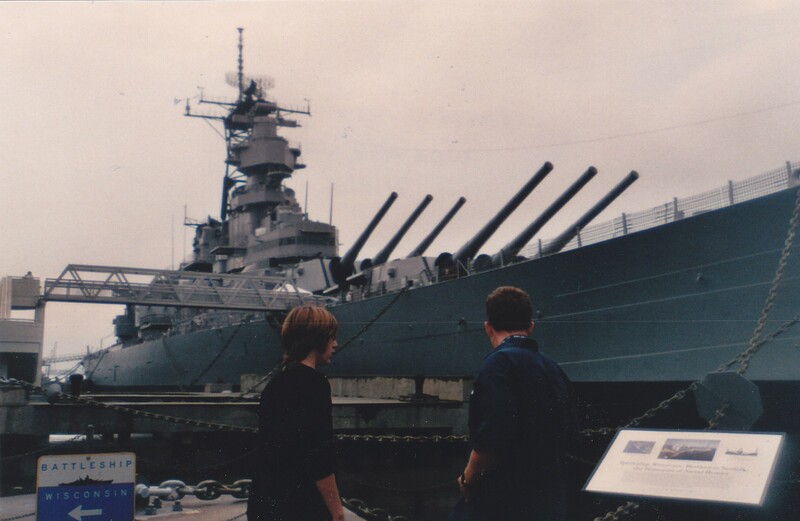 Our 2008 Road Trip, Part 10: Sinking Feelings on a Battleship « Midlife Crisis Crossover! Battleship! Not from Milton Bradley! 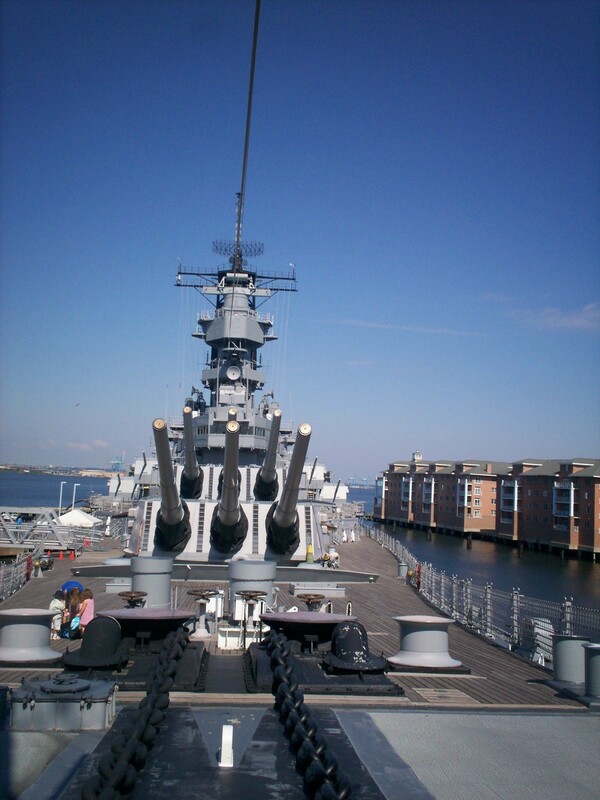 Given that America’s east coast is the home of numerous military hot spots, it followed that the Virginia area would offer touring options for at least one of them. Our warcraft of choice was a bit of a drive from Virginia Beach, but seemed like an interesting idea at the time. We might remember it more fondly if it weren’t for my ongoing physical issues, and if hadn’t taken us two tries to gain battleship access. Our 2007 drive down to Orlando had one personal milestone for me: my first contact with the Atlantic Ocean. My moment lasted about ten minutes before thunderstorms chased us away from the coast. As Atlantic beach experiences go, Florida gave me a lousy first impression. For 2008 we decided a second try was in order. Rather than take back-to-back trips to the same state, we researched other east-coast beach options, judged them by their nearby attractions, adjusted for our modest budget that couldn’t possibly afford upper-class oceanfront accommodations, and settled on what we hoped would be a suitable sequel. Thus in this year of our Lord did we declare: the Goldens are going to Virginia Beach! DAY FIVE: Wednesday, July 16, 2008. Morning arrived. Chairtime was over. I felt no different…but sometime during the restless night, I’d had an epiphany of the obvious: not all of my symptoms of discomfort were tied to the apparent muscle strain. An obvious culprit that had evaded my brainstorming and everyone else’s: dehydration. It wouldn’t be my first time, but it hadn’t even occurred to me, despite my repeated and prolonged exposure at Virginia Beach, followed by all-day sunshine at Busch Gardens. Of course, even as a stubborn, distracted amateur under duress, my skills of barely informed diagnosing should’ve solved the mystery sooner. The lack of accompanying sunburn is probably what led me astray. The last time the sun attacked me on vacation, exhaustion and sunburn had sucker-punched me together. I hadn’t considered the possibility of the former without the latter, because sometimes I’m a big dummy. We had breakfast own the street at Denny’s, where I avoided caffeine and chugged most of their juice supplies instead. The increased liquid intake and maybe a few electrolytes made an initial minor impact. The timely food service and frequent refills cheered me up a bit and kept me from holding a permanent grudge against the city of Hampton as a whole. Denny’s was far from a magic bullet, though. I carried my misery with me further into the morning, and still had to focus on my diaphragm to ignore the various pains near my hip and in my chest. I took comfort in the lack of tingling in my limbs, but the idea of seeking a Virginia care facility was tempting me more and more. Like déjà vu but in reverse. After our slow, slow meal at Our Daily Bread and the ten-minute ordeal of paying for our order was completed, we walked for only a few more minutes before deciding to blow off the beachfront for the moment. It was after 4:00, but my backup itinerary included another local attraction whose website said they’d be open till 6:00. We trudged back up north to the parking garage and returned to the interstate just in time for rush hour. In previous vacation write-ups that phrase usually signified the road-rage kiss of death, but I found I-264 from Virginia Beach to Norfolk to be no big deal. Anne was probably terrified once or twice, and it calmed no one’s nerves when I found the roadsigns disagreeing with my MapQuest directions. I tossed the directions and decided to wing it for the last mile. For once, my driving improv worked. 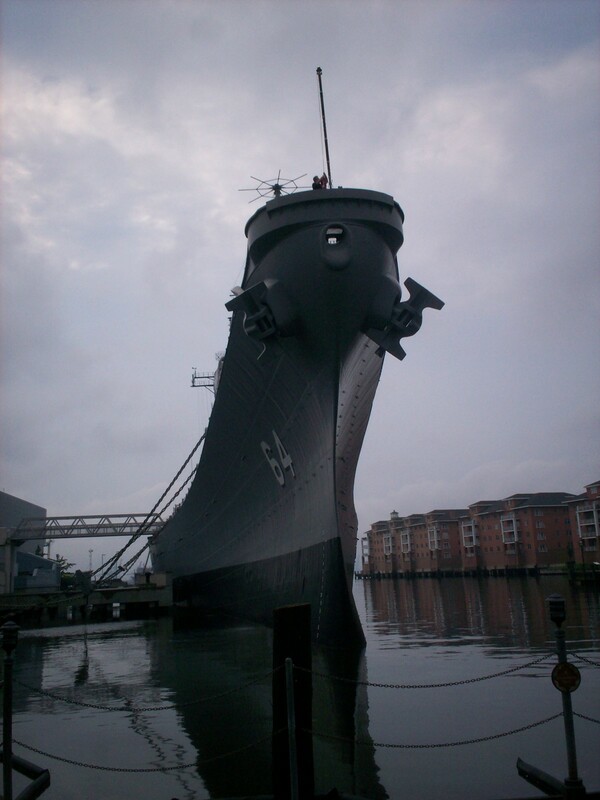 I pulled into a parking garage right across the street from the USS Wisconsin, a decommissioned battleship docked at the Hampton Roads Naval Museum along the Chesapeake Bay. Some portions of the museum require a fee, but the Wisconsin itself is open to free public tours. 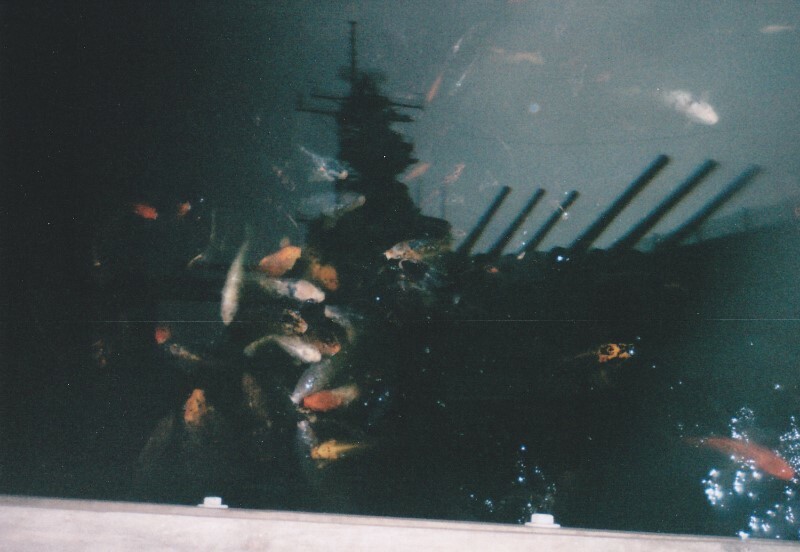 We stopped for a few minutes outside the entrance so my son could pump quarters into a feed dispenser and shower fish food on a school of koi loitering below the dock. He likes animals. It was cheaper than an aquarium. What’s the harm in letting him bring a little light into the lives of these greedy feeders below. Not very good at posing for photo ops. We walked indoors at 4:50 to find the place crawling with the most cheerful, helpful, actively customer-service-oriented staff of any business we frequented that entire week. I sincerely liked that the guide closest to us was empathetic enough to share in our deep disappointment as she told us that no tours could go in after 4:45. In gratitude, I declined to throw a public tantrum or to hold a grudge against my nature-loving son for the rest of the week. We returned to Virginia Beach, where the rest of the evening continued coasting downhill like a soapbox racer collapsing into kindling. On Wednesday we arrived shortly after opening while the place was deserted. Brief history lesson: the Wisconsin served in the Pacific Theater in World War II followed immediately by the Korean War, then was decommissioned for a time before sailing away for one last tour of duty during the first Iraq war. Tours were free, but guests weren’t allowed inside the ship, only around the spacious multi-level deck. Retired veterans were stationed at intervals to greet us and rattle off memorized technical stats and random wartime anecdotes. 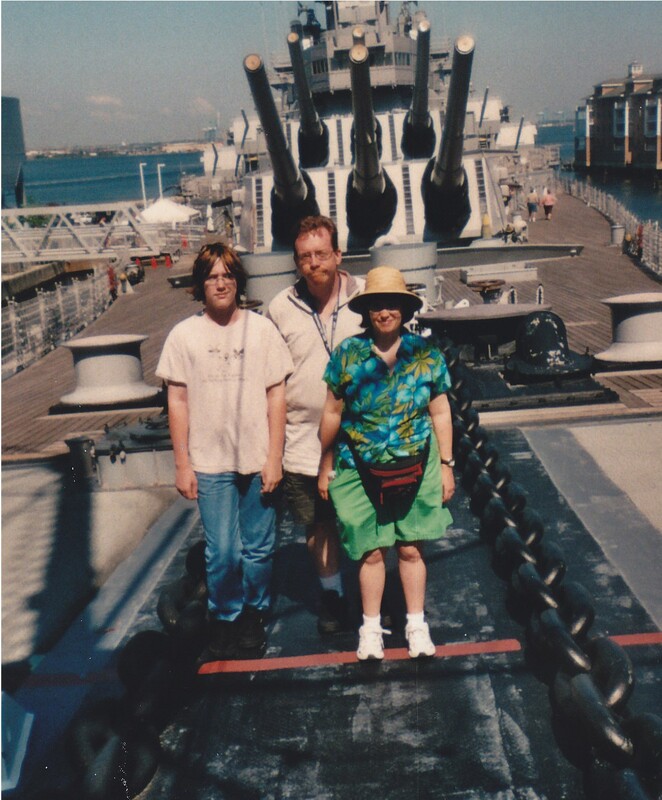 The first greeter sat at the bow of the ship and politely offered to snap one of the worst family photos of our lives. Not even Fox would greenlight a sitcom for a bedraggled family like this. The cast of Raising Hope would just look sad and toss pity-quarters at us. To be fair, the world was against us. I was in multiple forms of excruciating pain. My wife was worried sick about me. My son just hates having his picture taken in general. We were all staring directly into the rising sun. Our septuagenarian photog had already been outside for a while himself and wasn’t exactly a robust Jack LaLanne type. We had only one advantage over other tourists: our guide loved the nostalgic treat that was Anne’s 35mm camera, one of those ancient artifacts that would frighten and confound the under-21 crowd. I don’t envy his everyday chagrin at having to do the same with dozens of digital cameras that no doubt feel like Starfleet technology to him. Lucky for him the batteries in my digital camera had died overnight and I’d forgotten to pocket any spares. Maybe I could ignore my agonies and just focus on the military hardware. Yeah, that’s the ticket. Oh, hey, look, big cannons are cool! The other veterans on duty were just as polite, though one gentleman went just a little too far into the TMI zone. He gave us anecdotes, he presented an abstract of his doctoral thesis on the evils of the Clinton administration, he told us about his family and his recent medical issues, and he pointed out his apartment complex on the opposite shore. I began to wonder if he was auditioning for us in hopes that we might adopt him, or at least send him Christmas cards. We climbed up and down the remainder of the deck and took in the remaining sights (gun barrels! missile chambers! portholes! chained cabinets! 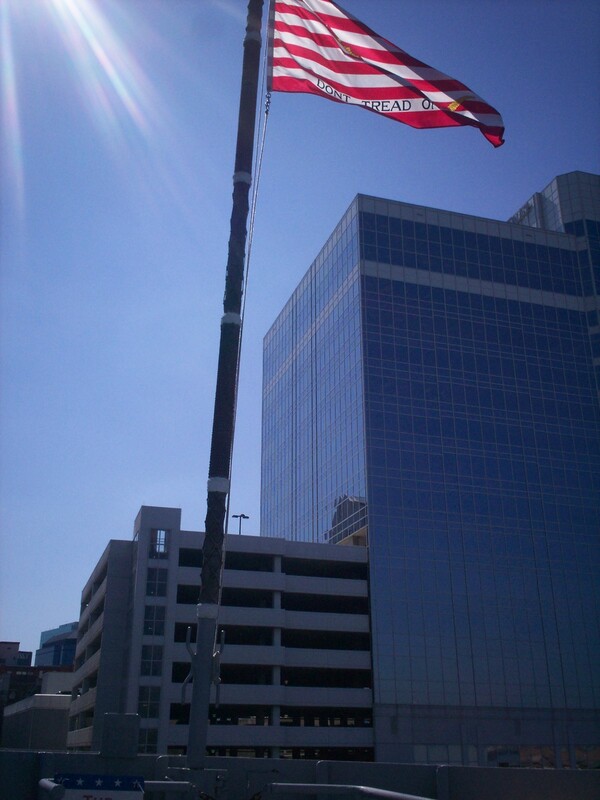 ), then reentered the adjoining Hampton Roads Naval Museum. We acquiesced to the request of a curator-type employee to complete a customer satisfaction survey, though the walking and the sunshine had drained me again and left me impatient with trivialties. In return, he gave us a gift shop coupon. Given the length of the survey, it was an expected gesture but an uneven trade. We looked around the free portion of the museum only briefly, but we’re not exactly Navy connoisseurs and we feel no moral compulsion to take advantage of any and every freebie tossed our way. Sometimes it’s okay to say no to free stuff. 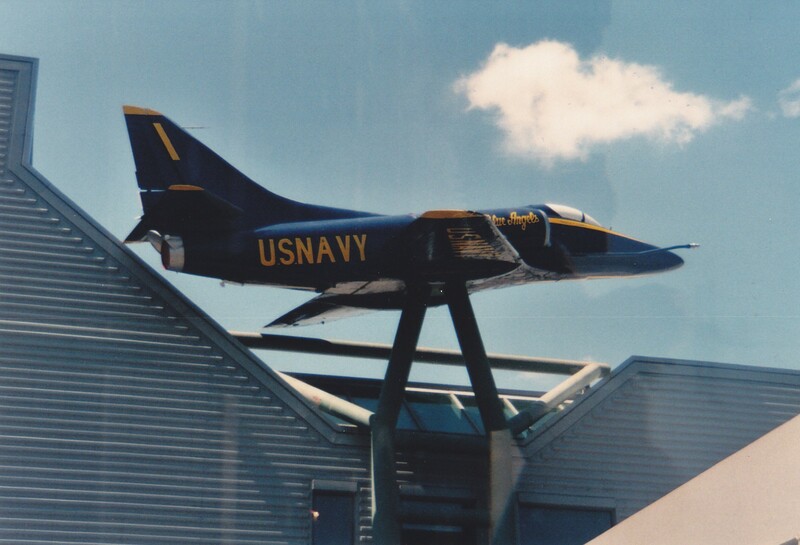 Also decommissioned: this Blue Angel mounted on the flight deck. From there we headed back to I-64 and made a pair of unplanned stops before our next attraction: one at the hotel for AA batteries, the other at the nearest gas station for anything filled to the brim with electrolytes. Enter the marvelous invention of G2, a recently introduced low-sugar Gatorade variant that was also a boon for the post-diet maintenance that was likewise failing me this week. After quaffing several more bottles throughout the day in three different flavors, the effects of overexposure magically subsided by nightfall. G2 didn’t solve all my problems, but it brought me back from the brink. Anne insisted we try taking one non-terrible photo before leaving. It’s no accident that I’m facing directly away from the sun this time. 1. For a previous adventure of me versus murderous summertime heat, check out the time I threw up on a Six Flags ride outside Baltimore in 2003. If it helps, no one took photos of that part. 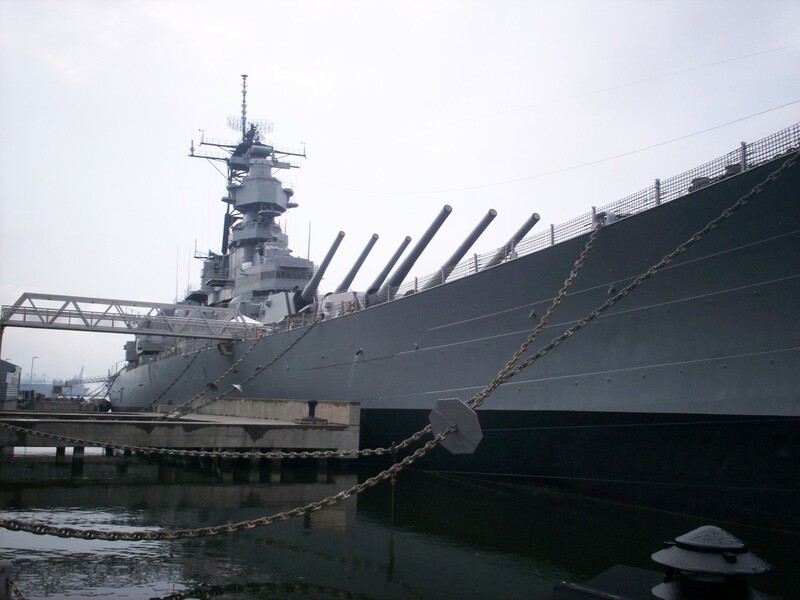 If you are interested, take a Tour of the USS New Jersey, located on the Camden waterfront just across from Philadelphia. She’s a big one! More than 50 yrs. ago I saw this mighty battleship throw a broad-side more than 18 miles to some target in Vietnam. It is truly a shame that these huge warships have been taken out of Service by the US Navy. I have seen their awesome power and what they could do. Wow. My wife may know about the New Jersey, but I was unaware. Sounds fascinating. We plan to return to the Philadelphia area someday, so we’ll have to add it to that list. 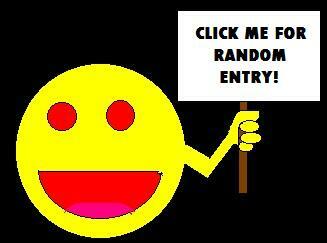 Thanks very much for the tip and the testimony. Your Welcome, Sir. I have been aboard the New Jersey now that she is a musuem. Her teek wood decks are starting to fail and some things are rusted. 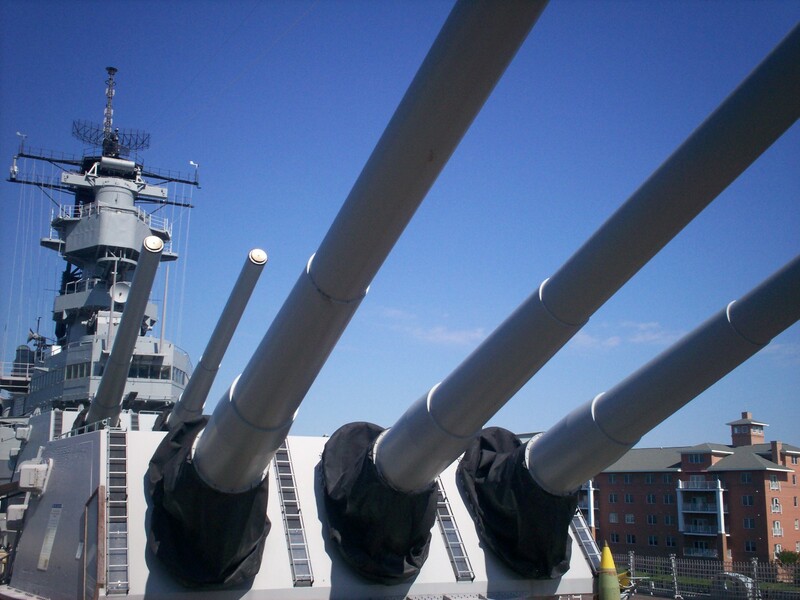 You can climb up inside her #1 Gun Turret to see how the 16″ guns work. It’s rather tight quarters. Go down into the lower decks for the berthing spaces and machine shop. 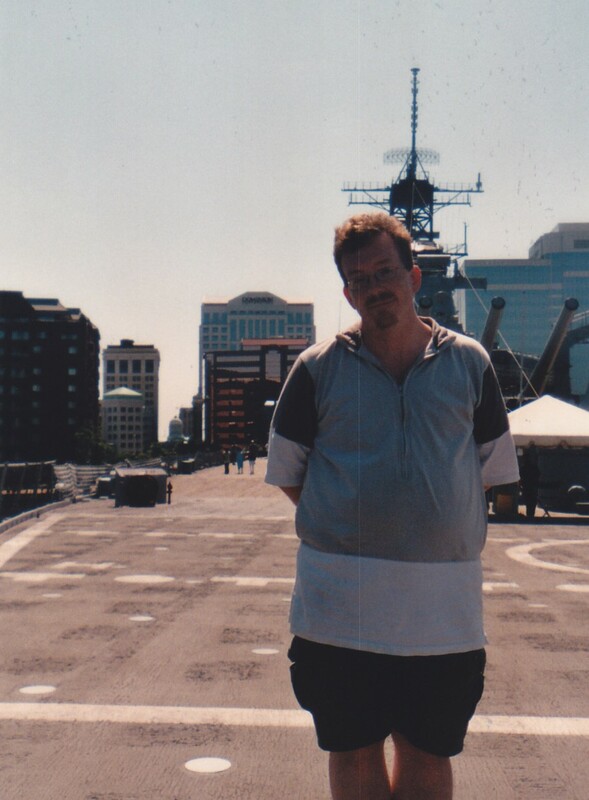 When I went aboard, I was able to walk the ship on my own because of being a Navy Vietnam Vet. While on station in Nam I could hear the 16″ shells go over my head, but never saw them! She had awesome firepower. Would wipe out a whole Vietnam village with one broadside!